La Bahia de Halong (Halong Bay en inglés, también conocida como Ha Long Bay) es un conjunto de islas de paredes verticales que se alzan como flotando sobre el Mar de China, uno de los paisajes mas espectaculares de la tierra, declarado Patrimonio de la Humanidad por la UNESCO y uno de las visitas casi obligatorias para todo viajero en Vietnam. La visita se suele hacer como una excursión de uno o varios días e incluye un crucero entre las islas, visitando una o varias de ellas. Es habitual pasar una noche con el barco fondeado en algún rincón resguardado. Indice de temas del foro relacionados con la visita a la Bahia de Halong: excursiones, islas, barcos, etc. Podéis mirar si hay algún crucero que os interese, la verdad es que estuvo bien de precio. Pick up from Cat Bi Airport in HaiPhong to Cat Ba Island - Lan Ha Bay - Ha Long Bay - Ha Noi . Our guide and car will pick you up at Cat Bi Airport to Ben Binh Pier in Hai Phong. Take a speed boat to Cat Ba Island (apro 45 minutes). Transfer to your hotel. The rest of the time is free to relax on the 3 beautiful Cat Co beaches on the island. Overnight in the hotel. 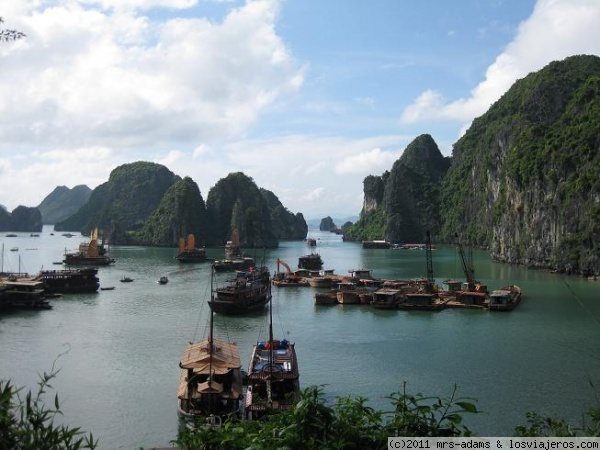 AM Sail around Lan Ha Bay.Visit amazing landscapes and a floating fishing village. Kayaking to discover the bay,swim & snorkel at deserted beaches and coral reefs. 11.30 Continue sailing through Ha Long Bay. 13.00 Sail to three famous Ha Long Bay caves (Me Cung cave, Luon cave ). 15.00 Kayaking at your leisure through rock arches to discover hidden lagoons and limestone tunnels. and a visit to Ha Long Bay's beautiful sister, Bai Tu Long Bay. 12.00 Have lunch on the boat. our guide and car will pick you up at Ha Long City to Ha Noi . Transfers within the tour, including pick-up and drop-off at Hotel in Cat Ba. Hydrofoil ticket Hai Phong – Cat Ba . 1 night accommodation at the hotel in Cat Ba Town. Local English Speaking Tour guide. Other languages are upon requested. Beverages and meals do not indicate in the program. After breakfast, our guide and car will pick you up at your hotel then depart to Hai Phong City . On the way, enjoy beautiful scenery of the Red River Delta, typical of Vietnamese countryside. Upon arrival at Hai Phong wharf, take a speed boat to Cat Ba Island (apro 45 minutes). Transfer to your hotel. The rest of the time is free to relax on the 3 beautiful Cat Co beaches on the island. Overnight in the hotel. Wake up to see the dawn on the bay and then have breakfast. Enjoy the last swimming on the beach and a visit to Ha Long Bay's beautiful sister, Bai Tu Long Bay. - para cruceros de dos dias una noche, 7 $ por persona. - para cruceros de tres dias dos noches, 17 $ por persona. Si ya habéis comprado/reservado el crucero, os deben avisar por e-mail. A mí desde mi hotel en Hanoi ya me han avisado, muy correctos.